Gift of Blount International, Inc.
Snyder was born in 1894 in the Blue Ridge Mountains of rural Tennessee, the heart of Appalachia. Her parents could read and write, unlike most adults in the region, but still saw few prospects beyond subsistence farming. They decided to move west for the same reasons that many other white settlers migrated: they sought greater opportunity for themselves and their children. Snyder’s family arrived in the small town of Roseburg, Oregon, in 1903 when she was 9 years old. They didn’t find the financial security they had hoped for; her father changed jobs every few years, and her mother worked in a laundry. But Snyder was able to attend public school and, by the third grade, began developing an understanding of herself as an artist. In 1916, at the age of 22, she married Edmund Snyder, who had been raised in the Christian utopian community of Aurora. They moved to Portland, where he would become a lifelong accountant and she an artist. Snyder worked in many media, including painting, prints, and collages. Throughout much of her career, she worked in different styles concurrently, shifting between abstraction, impressionism, and more realist portraits. Her subjects included the people, landscapes, birds, and everyday objects that surrounded her. Snyder was, in the words of one critic, “an artist who learned by doing, who taught herself through observation and experience.” Indeed, most of her training occurred outside of any school. Snyder spent less than two years studying painting at the Museum Art School (now Pacific Northwest College of Art) before leaving to take care of her infant son. She did, however, develop a close community of friends and mentors, including the painters C. S. Price and Charles Heaney and the Museum Director Anna Belle Crocker. And she studied independently throughout her life, collecting art books, magazines, and newspaper clippings that nourished her practice. Her friendships and research sustained her during the 1930s, ’40s, and ’50s, when Snyder suffered from severe dizzy spells (eventually diagnosed as Ménière’s disease) and was almost unable to leave her house. During this same period, her artwork gained recognition, earning numerous prizes and sales. Snyder went on to have 32 one-woman exhibitions. She produced thousands of artworks in her lifetime and continued to paint until a few months before her death at the age of 86. The Forest in Autumn features the bold colors, rich texture, and thick brushstrokes that are emblematic of Snyder’s painting. The painting reads as abstract—a dense and vivid collection of vertical brushstrokes—and also as strongly evocative of the sensation of standing in a birch forest of the Pacific Northwest. While more traditional landscape and forest paintings depict a horizon line and trees in full view, here dense trunks dominate the imagery and seem to take over the foreground of the painting. Horizontal lines in the background allude to a sense of depth and more parts of a forest scene. Snyder depicts a brief moment in the year where a mostly green-dominated Pacific Northwest is temporarily abundant with an array of cool and warm colors. How would you describe this painting to someone who cannot see it? Write 10 words describing your visual experience of Snyder’s artwork. Then, imagine experiencing this painting through your other four senses. What would you hear, feel, taste, and smell? You may imagine that you’re experiencing the painting itself or that you’ve entered the world represented in the painting. 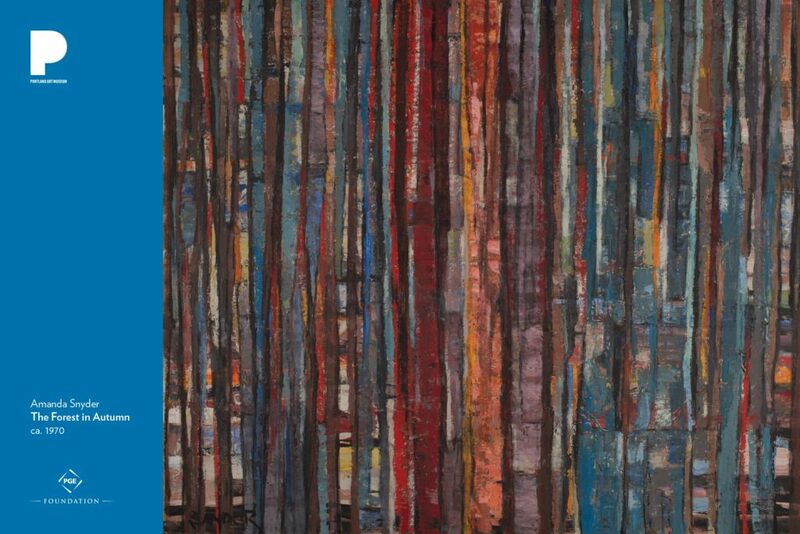 Snyder’s painting presents strong vertical lines—the “trees”— but horizontal lines as well. How do the horizontal lines help or work with the vertical lines? Does this painting have a foreground and background or convey a sense of depth? Biographies of Amanda Snyder often call out the gender-specific contours of her life: She left art school to take care of her son. Her husband’s career as an accountant provided the financial stability that allowed her to focus on art. In her son’s words, “Even though she was dedicated to her vocation—she painted every day—she found time to garden, sew, can fruit, and enjoy all the other household activities that helped make her a good wife and a good mother.” What do you think were the challenges and strengths of being both a woman and an artist in mid-twentieth-century Oregon? How did these factors shape Snyder’s career and works? How does gender impact the lives and work of artists in Oregon and the United States today? Discuss Snyder’s painting, looking carefully at how the artist has used layers, shapes, and colors. Think of your favorite place. It could be a forest, beach, park, or room. What colors and shapes can you find there? Introduce materials, create artwork, and share!